Tennis elbow is also known as lateral epicondylitis or lateral epicondylosis. It is a cause of pain on the outside of the elbow. Most people who suffer from this condition do not play tennis. The pain is typically worse when combining gripping and twisting such as wringing out cloths, using a screwdriver, twisting off jar lids or pouring a kettle. People who play racket sports notice that the symptoms are worst when miss-hitting a backhand shot. 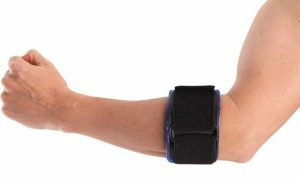 It can also be painful first thing in the morning or when straightening the elbow after a prolonged period of being bent up, such as after a long phone call. The diagnosis is usually made clinically on the basis of a characteristic history, as above, followed by examination which reveals point tenderness on the outside of the elbow and pain made worse when the middle finger is held up against resistance. Sometimes an ultrasound or MRI is required to confirm the diagnosis. We now understand that this is a self-healing condition for 95% of people over the course of 12 months. Home exercise programme [success shown in research from Sydney, 2019]. Do the following exercises 3 times per day with 10 reps of each exercise. Start with no weights but increase, as pain permits, in 0.5kg increments up to a maximum of 2.5kg. We no longer recommend cortisone injections for tennis elbow during the first year because of the issue of rebound pain and because it seems to prolong the natural healing process. Those people who have persistent symptoms for over a year and who have tried all the above might consider a cortisone injection. When all else fails then an arthroscopic tennis elbow release is successful for 80% of people. When all else has failed and the symptoms have persisted for more than 12 months then a keyhole (arthroscopic) operation can be a successful last resort. This is performed as a daycase procedure under a general anaesthetic. After 48 hours the bandages are reduced and you can start to use your arm gently. We recommend avoiding heavy, strenuous or repetitive activities for 6 weeks. However you will be able to drive after 1 week. Harry talks more about elbow arthroscopy in this video. 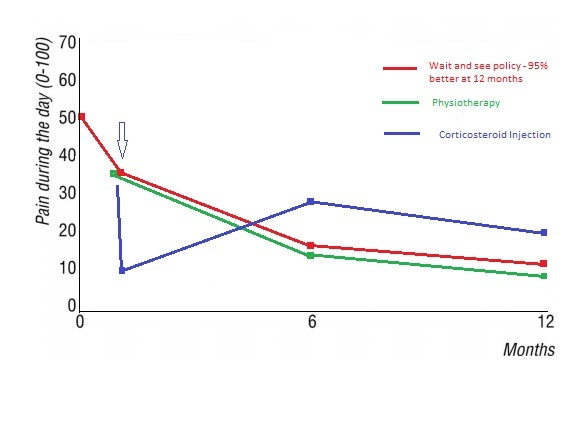 Post-operative physiotherapy protocol for arthroscopic tennis elbow release can be found here. Over the last few years Harry has performed 146 of these operations.